Add the juices to separate bowls. Divide gelatin equally, add to each bowl, and let soak for approx. 5 min. Add the juices to separate pots. Add one third sugar and lemon juice to each pot and heat carefully (don’t simmer) until gelatin and sugar are completely dissolved. If using, add green food coloring to the apple juice mixture. Grease silicone molds and dust lightly with starch. Fill carefully with the juice mixtures and let cool for at least 90 min., or until totally firm. 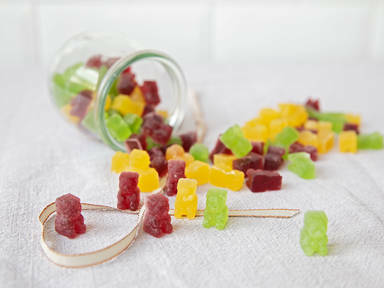 Press the gummy bears out of the molds and store in a sealable glass jar. Enjoy!